Bell Choir rings out praise! Bells of PEACE handbell choir performs during Sunday morning worship services and special concerts at PEACE Lutheran Church. Our beautiful handbell choir performs monthly during Sunday morning worship services. Hand-rung bells present an unusual and very old form of music. We invite you to enjoy Bells of PEACE before, during and after Sunday morning worship services. Bells of PEACE practices every week in our Sanctuary and performs monthly. In addition, the handbell choir performs for special events, including our free mini-concerts offered every December. The choir is under the direction of Marge Shasberger. For more information, contact Marge at (530) 273-9631. Practical roots: Handbells originated about 300 years ago as a way for the ringers of large, church-steeple bells to practice before taking their show up to the very public platform of the bell tower. Soon, their beauty and resonance inside the church grew to be appreciated in their own right. Read more about the history of handbells here. Handbell notes range from high, delicate tones to deep, low tones. All kinds of music have been transcribed — and even composed — for this beloved musical tradition. 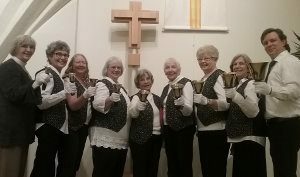 Our Bells of PEACE handbell choir is one more way that we at PEACE Lutheran Church express the joy of our faith in God. We believe God has given us humans the sublime language of music both for our own expression and enjoyment, and also for the sacred purpose of praise. Learn more about music at PEACE Lutheran CHurch.